This camera can be regarded as the evolution of the Sony Alpha 33 and in its interior, encased in a polycarbonate resin body we find the acclaimed Exmor CMOS sensor that that powers other Sony offerings such as the high-scoring Alpha 580. It boasts an electronic viewfinder dubbed ”Tru-Finder, (Xtra Fine)” with 1.15 million dots effective resolution and a 100% frame coverage, according to Sony’s press release. No news here, this camera has given us the same test results as the SLT A55. 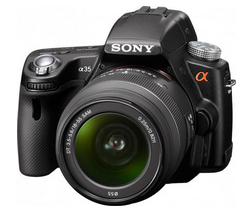 On the other hand, when compared to the Sony A33, the newest model delivers a better performance on lowlight. Since the translucent mirror used on this model is static, light makes an inevitable passage through it therefore having an impact on the camera’s transmission, we lose between 1/3 and 2/3 stop, which -unless a more translucent material is found- is the best Sony could come up with. Nevertheless, those interested in shooting video with this camera will find it a fair compromise. Being the only company to propose the Translucent Mirror Technology we could say that this is a unique feature, already marketed by Sony as “exclusive”. See the following comparisons with cameras that use the same sensor chip.